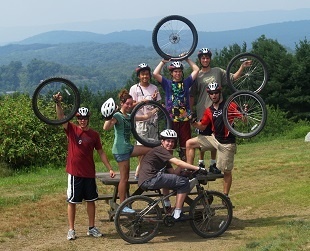 We love to mountain bike at Stone Mountain Adventures Teen Summer Camp. 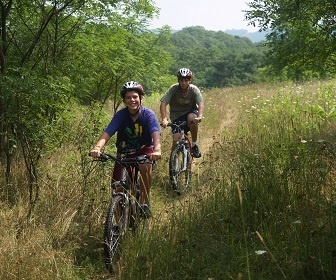 We ride on varied terrain including winding country roads, rolling hills, "Rails to Trails" and the world class single track Allegrippis Trails. We teach good bike riding form and technique to aspiring as well as seasoned riders. 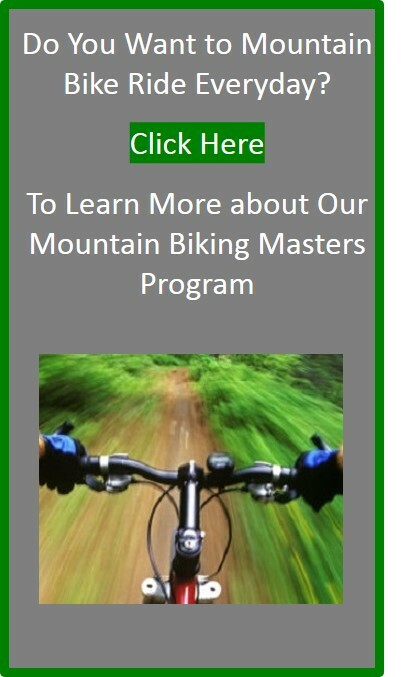 Our mountain biking camp program emphasizes skill development, proper riding technique, safety awareness, and enjoyment. In addition, campers learn basic bike maintenance and about the parts of the bike and safety equipment. 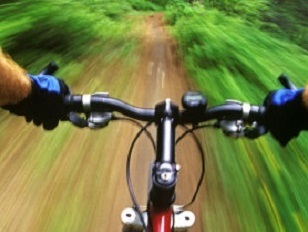 Our bike shop houses mountain bikes for all sizes and provides room for campers that wish to bring their own equipment. Riding begins on the fields at camp where campers practice proper braking, shifting, maneuvering over obstacles, and staying relaxed on the bike. Next, the campers begin to explore the trail network including a skills park at Stone Mountain Adventures using the foundation of skills they have developed. 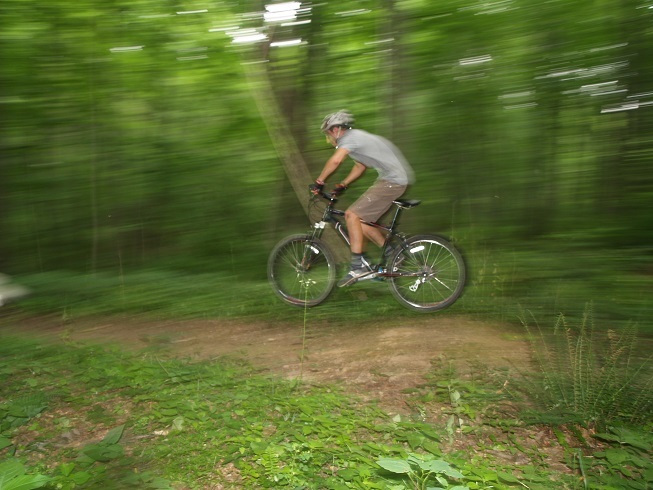 As campers progress further in their skills and excitement for biking, they move off-camp to the Raystown Lake Skills Park, the famous Allegrippis Trails at Raystown Lake and the more technical trails in the Rothrock State Forest. We also ride "Rails to Trails" along the Juniata River. Great camp counselors who are mature, knowledgeable, and fun are the backbone our camp and the mountain bike masters program. Our experienced staff will evaluate riders and teach technical riding techniques that will help campers take their riding to the next level. Keeping campers safe is always our number one priority. Teaching campers to keep themselves safe by riding in control is an integral part of our program. Our staff are also there lead by example and to motivate campers to push themselves and safely stretch their comfort zone. The foundation of our mountain bikings program is fun with a good dose of skill development. Our staff start by evaluating campers' riding strengths and identifying areas of improvement. Our instructors take time to teach basic and advanced riding skills and provide campers the opportunity to practice those techniques in the skills park and on the trails. Campers also learn trail etiquette and how to "share the trail" with other user groups. Riding begins on the fields at camp where campers practice proper braking, shifting, maneuvering over obstacles, and staying relaxed on the bike. Next, the campers begin to explore the trail network including a skills park at Stone Mountain Adventures using the foundation of skills they have developed. 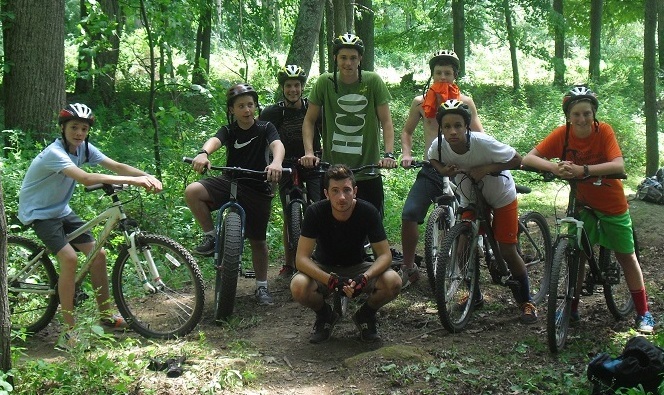 As campers progress further in their skills and excitement for biking, they move off-camp to the famous Allegrippis Trails at Raystown Lake and in the Rothrock State Forest.